Find Out What to Expect Every Race Weekend! Organize Your Race Program to Perform Flawlessly! Find Sponsors and Keep Them! Learn What the “Go-Fast” Books Don’t Teach You! Get in the Best Mental and Physical Condition for Racing! Quantify and Improve Every Race Weekend! Learn What to Eat and Drink for a Race Weekend! Use “Theory of Distractions” to Improve Every Race Weekend! Learn How to Choose the Proper Safety Equipment! Feel free to drop me an email with any questions that you may have about racing, or send your phone number and the best time to call, and we’ll talk! My book is all about the things the “Go Fast” books don’t teach, because there is a lot more to racing and winning than going fast! Because we both love racing, and I want you to be as successful as possible while being able to enjoy racing for the long haul! Other racing books tell you how to go fast… but it takes more than speed to become a winner! As a former WERA race club owner, I have unique experience in every aspect of racing. From Tech Inspection to Race Control, I know what goes on in the course of a race weekend. As a promoter and racer, I know what it means to bring sponsors on-board, and what it means to keep them. And as a racer of many years, I can share many insights to successful organization, preparation, safety, and teamwork. These and other important aspects of your racing program can be improved upon by simply reading this comprehensive book! It’s all here in “Race to Win!”!!! "This book makes me want to go out, buy a new bike, and start racing!" "Through Alan's diet and training advice, I was able to make world record power lifts that really boosted my power lifting career!" "The depth of the training, diet and nutrition information in this book is nothing less than fantastic!" New Custom Log Books! All the forms and systems you’ll need to keep a useful race log! 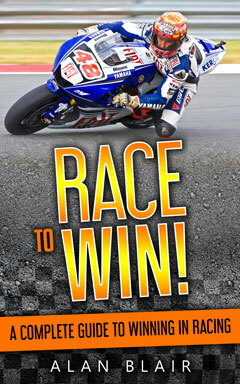 © Race to Win - A Complete Guide to Winning in Racing · Alan Blair All rights reserved. Race to Win is a Project Safety Partner.